The City of Austin and Austin Resource Recovery is expanding it’s new Curbside Composting service to 38,000 more homes beginning June 25, 2018! Along with the 52,000 customers that are already taking advantage of this service, nearly half of Austin’s curbside customers will now have access. How does Curbside Composting work? The City of Austin aims to divert 90 percent of materials from landfills by 2040 with its Zero Waste goal. According to recent studies, about 50% of everything sent to the landfill by residential customers could have been composted. 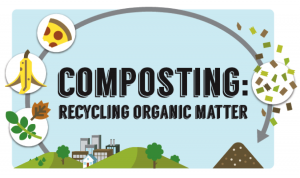 Compostable materials that end up in a landfill do not break down properly and end up being the number one source of human-caused methane released into the atmosphere. To help combat this, the Curbside Composting Collection Program collects food scraps, yard trimmings and food soiled paper from residential customers and transports these to a local facility to be broken down into compost. In the end, composting helps the environment, helps soil retain water and fertilizes lawns and gardens without using chemicals. Austin Resource Recovery has a great guide on what can be composted (Green Cart), recycled (Blue Cart) and trashed (Brown Cart). Print this infographic and post somewhere helpful in your home! ARR – Which Cart to Use? When will I get my green Curbside Composting Cart? 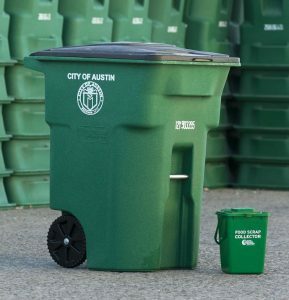 Austin Resource Recovery forecasts that all curbside customers will be added to the service by 2020. To check if your home address is eligible, review the collection schedule and view helpful videos visit ARR – Austin Composts. Learn more at one of the FREE Informational Open Houses!